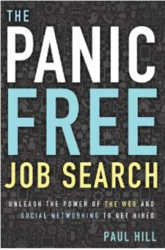 ‘The Panic Free Job Search: Unleash the Power of the Web and Social Networking’ author, Paul Hill, will be interviewed on April 2nd, at 9:00 PM EDT for a special “Book Talk Live” show on Vokle. The show will focus on President Obama’s statements in his State of the Union, about job security and the fact that “the rules have changed” and how Hill offers workers solutions to this new reality in his book. Hill’s contention is workers today must now embrace that the “New Job Security” is all about using LinkedIn, Facebook, and Social Networking Sites to secure work as well as promote their careers. 'The Panic Free Job Search: Unleash the Power of the Web and Social Networking' author, Paul Hill, will be interviewed on April 2nd, at 9:00 PM EDT for a special “Book Talk Live” show on Vokle. The show will focus on President Obama’s statements in his State of the Union, about job security and the fact that “the rules have changed” and how Hill offers workers solutions to this new reality in his book. Hill’s contention is workers today must now embrace that the “New Job Security” is all about using LinkedIn, Facebook, and Social Networking Sites to secure work as well as promote their careers. “President Obama recognizes the fact that “the rules have changed” and the impact these rule changes have on employment during his State of the Union Address” said Paul Hill, author of 'The Panic Free Job Search: Unleash the Power of the Web and Social Networking to Get Hired'. “Today, just about any company can set up shop, hire workers, and sell their products wherever there's an Internet connection.” President Obama concluded. Find out more about his groundbreaking book ‘The Panic Free Job Search’ and how he can help workers get hired, find job security, secure their incomes, and promote their careers. Join Herb Shaffner, from Shaffner Media Enterprises as he interviews Paul Hill author of 'The Panic Free Job Search' on a special “Book Talk Live” broadcast on April 2nd, 2012 at 9:00 PM EDT at http://on.fb.me/w3LRZr or at http://www.transitiontohired.com/Get-Hired-Fast-Track/.